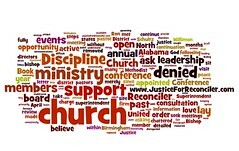 In the spring of 2011, the leadership of Church of the Reconciler, a United Methodist Church in downtown Birmingham, Alabama, was attacked by the leadership of the North Alabama Conference of the United Methodist Church. The clergy and laity who had begun and sustained the ministry of the church were falsely accused of misconduct and removed from offices of ministry by action initiated and coached by the leadership of the North Alabama Conference. This was done in an abusive, arbitrary, and capricious manner, without following the due process of the Book of Discipline of the United Methodist Church. This web site contains the story of the laity and former lay leadership of the Church of the Reconciler. The site displays the most recent post at the top of the home page. If you want to understand the full story of what happened, start with the first post at the bottom and read to the latest one — start at the bottom and read up! You can also read the posts by our Categories listed to the right. It has become clear that we will not receive justice at the hand of our bishop or from the United Methodist Church at any level. Three of our group continue their ministries of helping the homeless find housing, food, and healthcare at Church of the Reconciler. Others decided we could no longer be a part of a ministry in which we had no voice. Some former members have moved to other churches. In addition, many of us are now working together to form a new organization, the Birmingham Progressive Christian Alliance. We meet weekly for book study, prayer and communion. We share meals together periodically. We pledge to live nonviolently and to see Jesus in others. We work for justice. You are invited to join us. The bishop reconsiders. Sort of. Seemingly out of the blue, a year after we originally requested such a meeting, several of us received a letter of invitation to a listening session with the Bishop. We agreed to her conditions, which included meeting in a neutral location and that there be no recording of the meeting, “including audio, visual, note taking or verbatim recording.” A dozen members and former members attended the meeting. We were each given an opportunity to share our thoughts. At the end, Bishop Wallace-Padgett said she had come to listen and so would not make a response to us that night. We have heard nothing from her since. When Debra Wallace-Padgett was appointed bishop of the North Alabama Conference, we had newfound hope. 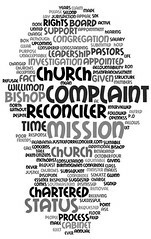 Perhaps, we thought, we would have a bishop who would listen to us and help us as we sought to recover our chartered status, our elected board, and our full ministry. After giving her a few months to settle in, we wrote and requested a meeting with her, so we could meet her, tell her our story, and seek restoration and reconciliation. She refused to meet with us. In October 2012, the Judicial Council considered our complaint. As with our other efforts to seek justice, none of us were contacted concerning our experience. We were denied the right to appear before the Judicial Council, we were not interviewed, and there was no investigation. The Council determined that they did not have jurisdiction in the case and sent it back to the North Alabama Conference, the very perpetrators of this injustice. Mailing sent to delegates of the North Alabama Conference with the following information included.